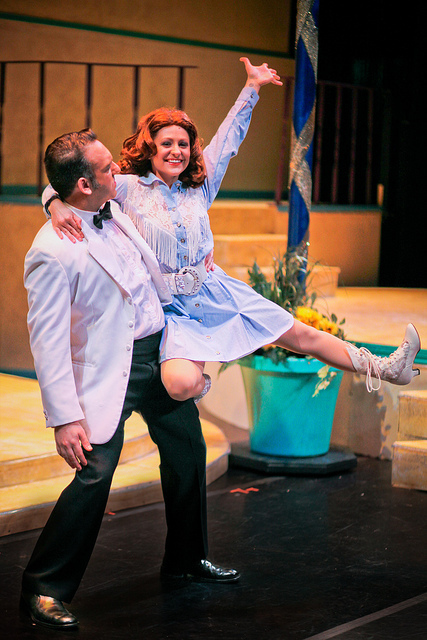 It is no secret that Masquerade Theatre tops the list when it comes to musical comedy offerings for the city of Houston, but I would have to say that the comedy portion of that equation has never been funnier than in the company’s recent production of Dirty Rotten Scoundrels. This musical edition has a clever book by Jeffrey Lane with music & lyrics by David Yazbek, all based on the 1988 film of the same name written by Dale Launer, Stanley Shapiro & Paul Henning. 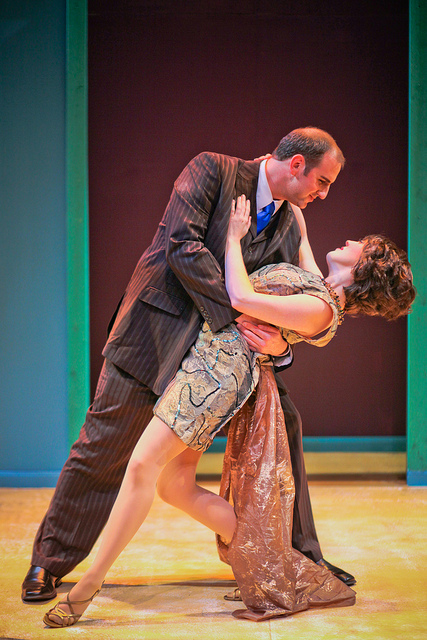 Several elements contributed to the success of Masquerade’s Scoundrels under the brilliant direction of Phillip Duggins. To begin with, the deliciously nutty plot offers the tale of two conmen that take pride in ripping off rich women on the French Riviera. Casting here was perfect with talented Luther Chakurian offering a cleverly droll performance as the slickly elegant con artist, Lawrence Jameson, while master of comedy, Michael J. Ross, played the hilarious role of Jameson’s foil and fellow conman, Freddy Benson. The comedy sparks that flew between these two Masquerade veterans shook the room with laughter, and there was added fun from the subtle performance of Adam W. Delka as Jameson’s bumbling assistant, Andre, who often reminds one of Peter Sellers as Inspector Clouseau. 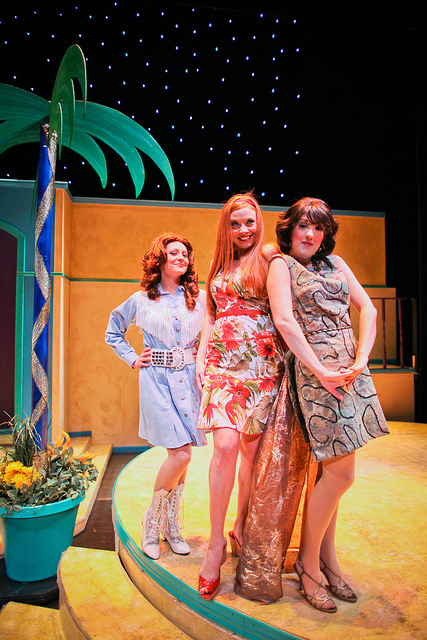 The show opens on the glamorous (and sometimes smoothly gliding) Mediterranean set design of Amanda McBee. We are quickly swept up in the equally glamorous choreography of Laura Babbitt as the members of the “Magnificent 10” ensemble give us a peek at the upper classes enjoying their privileges as they dance divinely to the lovely Latin-flavored Overture. Lovely pastel gowns and dashing tuxedos highlight the elegant and stylish formal costume designs of Joseph Gunter as they add polish to this and many other scenes in the production. Kristina Sullivan gives a smooth performance as Muriel and her lush voice was immediately on display with the song, “What Was A Woman To Do?” The witty script is punctuated by chic ensemble dance transitions from scene to scene, devilish double entendres, and clever bits of nonsense like an usher popping up to address the audience from the orchestra pit. One line in the dialogue states that, “Lighting is everything,” and lighting designer, David Gipson, must have taken that to heart in planning his gorgeous illuminations of each scene. Dominique Røyem conducted the fine orchestra, and the amusing Mr. Ross served as the show’s musical director, but it is worth noting that there were a few times when orchestral volume overwhelmed bits of dialogue and lyrics that could not be clearly heard. As the plot evolves, down-and-out Freddy convinces sophisticated Lawrence to be his mentor and teach him the ins and outs of conning the rich women of the Riviera. Freddy admires the wealthy lifestyle Lawrence has attained and he wants that for himself. Ross shows exceptional comedic skill as Freddy sings of his desire to acquire “Great Big Stuff,” in one of the most hilarious numbers I have ever seen on a stage. Ross “nails” the catchy tune and the zany comedy perfectly. This is a highlight of the show made even more so with brilliant staging for the merry ensemble of maids and butlers as they sing and dance while surrounding the uproarious antics of Mr. Ross. What a hoot! As if that was not enough fun, enter Lendsey Kersey in the role of Jolene, a wealthy cowgirl from Oklahoma. Kersey sparkles in the rousing number, “Oklahoma,” that launches the whirling choreography of a terrific hoedown from the ensemble. There was even a dancing cow that made it all seem most appropriate for the opening week of the Houston Rodeo. The laughs continue as Lawrence schemes to end Jolene’s plan to marry him by having Freddy pose as his lunatic brother, Ruprecht. This number, “All About Ruprecht,” was another showcase for delicious lunacy from Mr. Ross. The second act has no shortage of comedy as Freddy attempts to scam Christine by disguising himself as a handicapped soldier while Lawrence tries to undo that plan by posing as a doctor who can cure Freddy’s paralysis. The result is comic mayhem of the highest order. Andre and Muriel sing and dance the adorable, “Like Ziz, Like Dat,” and Lawrence and Christine perform the sensuous and elegant, “The More We Dance.” A resounding candle-lit choir accompanies Freddy & Christine for, “Love Is My Legs,” and Chakurian’s rich voice delivers a soft and satisfying, “Love Sneaks In.” There was a clever trick ending, and yes, there were plenty of pleasant songs well performed, but of this production it must be said that comedy was king. Bravo! 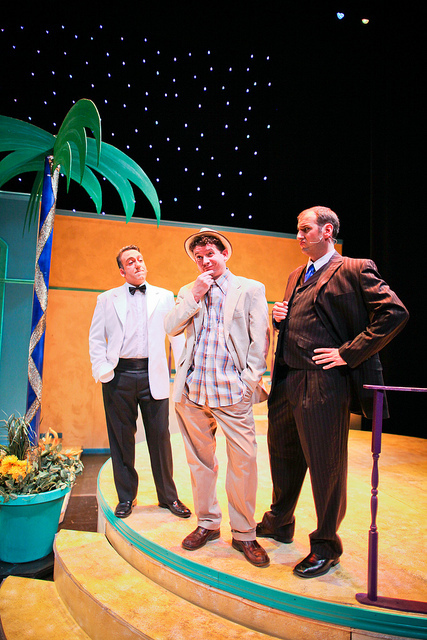 This entry was posted in Broadway, BroadwayStars.com, Masquerade Theatre, Miscellaneous Reviews, Theater Reviews, ThePeoplesCritic.com and tagged Broadway, Dirty Rotten Scoundrels, Entertainment, Houston, musicals, plays, Reviews, Texas, theatre. Bookmark the permalink.